Hiya guys and TGIF! 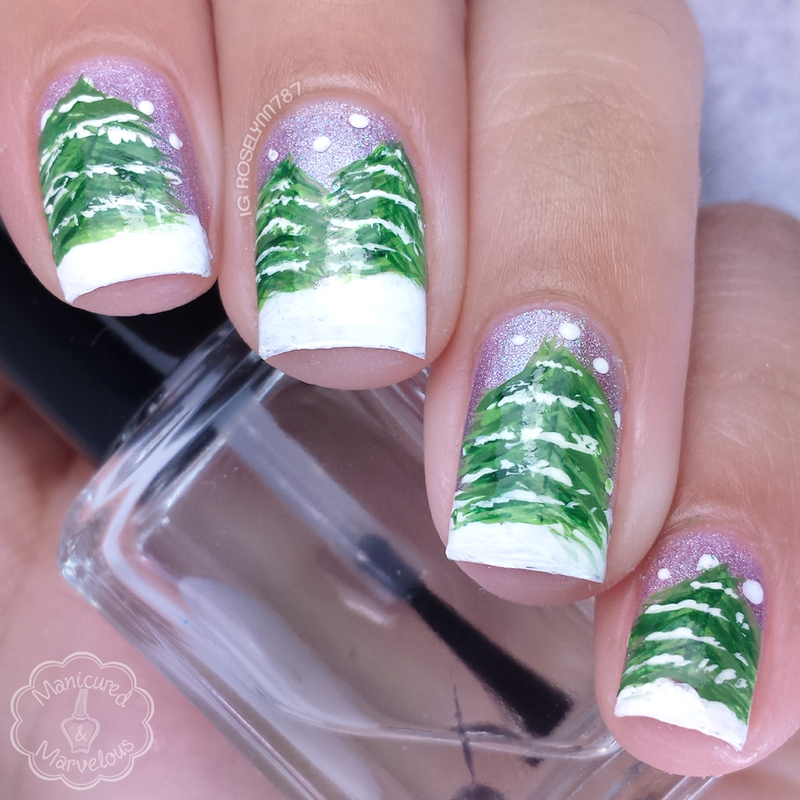 Before we get started on our weekend I have some more festive nails to share with you today. 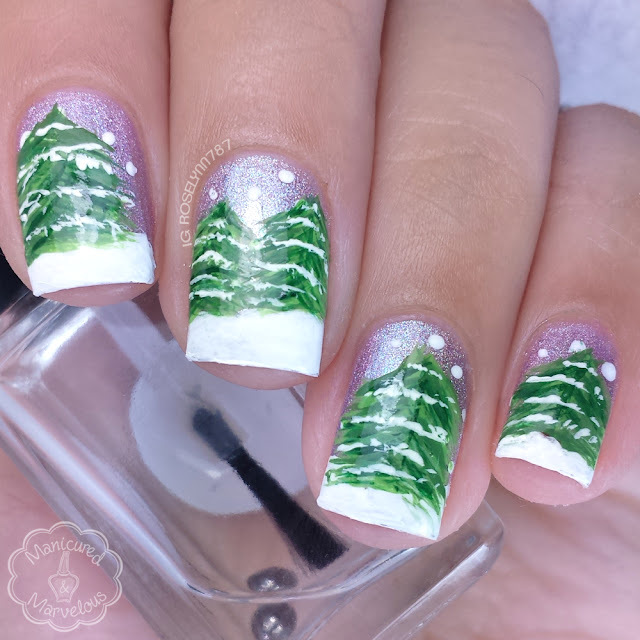 It's time for the next prompt in the Challenge Your Nail Art 12 Days of Christmas challenge. I'm sure you can guess what the prompt is haha, but just in case you can't it's... Christmas Trees! I debated back and forth on the kind of tree I wanted to paint, but ultimately decided for the natural outdoor scenery design. What do you think? Doing freehand is a lot like riding a bike... actually scratch that because I never learned how to do that. Let's just say that it has been a long time since I've done a full-on freehand mani. I honestly can't remember the last freehand mani I even did so it's safe to say it has been a while. That said, I don't think I did too shabby! Actually I am so pumped at how these turned out, mostly because I was just winging it haha. The key to doing freehand trees like this is using a light-hand and a thin brush. The ones I used for this design are from the Berry Wine set from Winstonia and they are so super thin it's great. 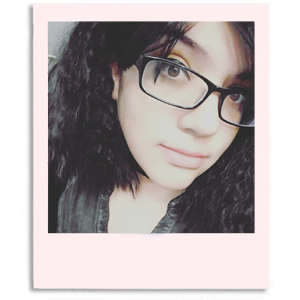 I purchased my set a few months ago and I am still in love with them so I definitely recommend them. And because I have apparently been on a roll this week there is a video tutorial too! In retrospect I do think I should of maybe scaled better are the dotted snowfall. They should definitely be a bit smaller in comparison to the trees. It's probably just me nitpicking though. You know how it goes, we are always our own worse critics. I hope you guys like these as much as I do. One thing is for sure, I think this mani has awaken the want to do freehand more often. Though what I'll do is another battle entirely, haha. Oh that good ol' inspiration blockage, you haven't been missed. If you guys have any suggestions for holiday manis let me know down in the comments. I love this challenge! Amazing! Thanks! I do too. It's definitely brought out the creative spark in me. I love this. I also adore that background. Right?! I adore that polish! Winged? Wunged? Whatever is correct, it definitely can yield beautiful results! I love these! Yeah grammar isn't my strong suit, but nail art sure is lol. I love these. I think you did an amazing job. And you are being your own worst critic. When I first seen this mani I didn't even think about the scaling. I think it's beautiful. You are killing it!! This looks fantastic and the pale background reminds me of a wintery sky. Yay!!!! Love Roselyn freehand nails!!! Yeah, these are preeeetty amazing indeed! Love your Winter Pine nail design!! These look great!! I love your freehand designs! These are amazing! I wish I could freehand as good as this. I guess it takes practice though! Yes definitely as the saying goes practice makes perfect! Beautifully done. I love that you added a tutorial too. No problem! I'm glad you like them. Oh wow! That's beautiful! Thanks for the video tutorial! Merry Christmas! Love love love this look! Your freehand is always fantastic! And, great tutorial!